Why Choose Texas for Online Higher Education? Research done by the Georgetown Center for Education and the Workforce projects 62% of Texas jobs created by 2020 will require postsecondary education. Similarly, an educational attainment study by the Office of the State Demographer summarizes that projected new jobs may require a 7.3% increase in the college-educated Texas labor force by 2020. An increased need for college-educated workers requires affordable access to higher education, especially online degrees. This page provides important information for prospective Texas college students located both in and outside the state, including a ranking of the most affordable online colleges in Texas, relevant state economy details, and research resources regarding transfer credits, financial aid, and degree programs. Each year thousands of students take advantage of more than 200 online programs in Texas. The numbers in the table below display enrollment data from 2016. Extensive online education opportunities offer accessibility and flexibility to underserved populations, such as full-time workers, single parents, and those looking for a career change. With everything from non-degree vocational certificates, to masters and advanced degrees available from accredited online schools in Texas, anyone can aspire to higher education. Traditionally, college tuition for in-state students costs significantly less than that of nonresidents. The table below offers an example of these differences. When considering online universities in Texas, the tradeoff of increased cost for out-of-state tuition comes with more flexibility. It should be noted this rule is general, and not universal. Some online schools offer tuition costs at a flat, per-credit cost to everyone, regardless of student residency. Even for those online institutions which place out-of-state students in a more expensive bracket, individuals living in neighboring states may be eligible for reduced costs through reciprocity agreements. As mentioned earlier, on-campus college programs split their tuition into two tiers: resident and nonresident. Many online degrees in Texas adhere to this model, while others charge a flat cost per credit regardless of residency. Tuition costs vary by school, but the examples listed below provide a representative look at prospective prices. Learn more about how your FAFSA works in Texas. For nonresidents in pursuit of an online degree in Texas, there are a few things every prospective student should consider. In addition to the table below, which includes 2016 enrollment numbers from the Integrated Postsecondary Education Data System (IPEDS), students should research any available state reciprocity agreements or exchange student tuition discounts. Additionally, students should be mindful of any state agreements or attendance restrictions that may inhibit a student’s ability to enroll in an online program. Prospective Texas college students living in qualifying neighboring states can receive discounts on tuition and fees, and in some cases, pay the same rates as in-state students. Texas is one of 17 states in the Southern Regional Education Board compact, which participates in the State Authorization Reciprocity Agreement (SARA), dedicated to lowering costs and increasing offerings for students. Through this compact and reciprocity agreement, the Midwest Student Exchange Program improves access for students to attend out-of-state schools. More than 100 public institutions participate in the program, which caps the increase schools can charge nonresidents versus residents at 150% for specific programs. In order to offer distance learning to nonresidents, institutions must meet the authorization requirements in each state from which they allow online students to enroll. SARA, administered by the regional education compacts in the U.S., works to establish national standards for these requirements. This increased uniformity makes the authorization process easier, and promotes greater access for students across state lines. Our ranking methodologies include qualitative and quantitative metrics: average in-state tuition price for first-time students, breadth of online programs available, student-teacher ratio, availability of career services, academic counseling, and average amount of student financial aid provided. All schools on this list meet minimum requirements, including accreditation and at least three online programs. Utilize our rankings below to find the online degree in Texas that best fits your goals and budget. *PBV is a proprietary metric that compares the cost of a program to the cost of other programs with the same (or a similar) qualitative score. It also compares the qualitative score of the program to the score of other programs with the same (or similar) cost. In short, the PBV calculation denotes the overall value – or ‘bang for your buck’ – of an online degree in Texas. Our Texas online college rankings are backed by data collected and analyzed from The Integrated Postsecondary Education Data System, a program managed by the National Center for Education Statistics. Surveying over 7,500 colleges annually, it is among the most longstanding and trusted providers of U.S. postsecondary information. Academic programs and educational opportunities at Wayland Baptist University reach far beyond the borders of Texas. The university has several branch campuses and learning facilities across six different states, a Kenyan center and an online school. In 2001, Wayland created WBUonline to administer online courses and, in 2006, it started offering fully online degree programs. Today, the school offers online degrees at all levels, from associate to doctorate. For example, there are five bachelor degrees available online - applied science, business administration, psychology (BA and BS) and Christian ministry. The Bachelor of Applied Science degree has 10 possible majors to choose from in versatile fields such as early childhood development, environmental studies and computer science. This program is built for students who already have technical or occupational training and are looking to broaden their knowledge and career opportunities in the field. Similarly, the Bachelor of Business Administration offers five areas of concentration and can be completed 100 percent online. Online classes last 11 weeks, and there are four sessions each year. Courses are operated through Blackboard, and multiple resources and tutorials for using the system are offered on WBU’s website. Texas A&M University, located in College Station, TX, has a distance learning department offering online degree and certificate programs to students in areas such as engineering, health sciences, education and agriculture. Texas A&M has both web-based on-campus courses and web-based off-campus courses as part of the university’s distance education programs. While the majority of online programs are offered at the graduate level, a Bachelor of Science in Nursing program is available to undergrads. This RN to BSN program is completely online, and students interested in enrolling must have an associate degree and credentials as a registered nurse. Because coursework can be completed entirely online, students in the RN to BSN program can take advantage of a discounted tuition rate that does not include technology fees and other campus-related costs. As part of the University of Texas school system, the University of Texas of the Permian Basin offers a variety of bachelor’s degrees through the university’s online education consortium. The agreement allows separate campuses to join forces and offer a broader range of programs through a combined effort. In total, UTPB has 16 online undergraduate programs available, five of which are degree-completion programs offered through the consortium. These fully online degrees can be earned in disciplines such as sociology, child and family studies, industrial technology, and criminal justice. Eight of the 16 online bachelor’s degrees available are conducted in an eight-week format. With shorter course lengths, students have six potential start dates each year. UTPB also offers 10 online graduate degrees and four certificates/endorsements. UTPB notes they not permitted to provide online education to some out-of-state students. To see if online courses and degrees can be offered in your state, visit the school’s State Authorizations page for the most up-to-date information. The University of the Incarnate Word, a Christian-based university, has online bachelor’s degrees available through its school of professional studies and adult education department. The programs were developed and sculpted to fit the requirements of working adults, so courses are offered at convenient times on campus or online in asynchronous format. UIW has seven online bachelor’s degrees available, with the opportunity to study in-person if desired. Students can pursue a degree in a variety of fields such as public administration, human resources, applied sciences and several areas of business. Online classes do not require any on-campus work and are provided at an accelerated eight-week rate. This gives students six semesters per year to take classes and the chance to complete their bachelor’s degree in a shorter amount of time. To encourage continued education, some students may be eligible for discounted tuition rates and all undergraduates receive free textbooks. For those interested in a master’s degree or higher, four online graduate degrees are available - a Master of Arts in Administration, MBA, MS in Organizational Development and Leadership, and a Doctor of Business Administration. The University of Houston-Victoria offers several online degrees in a range of fields, from criminal justice to education to publishing, at the bachelor’s and master’s degree level. Students in UHV’s School of Business Administration can earn a bachelor’s degree online with specializations available in supply chain management, marketing, finance, health care management, human resources or general business. The online Bachelor of Business Administration program requires students to complete general education courses either at a community college or at one of UHV’s campuses before beginning upper division work. All core business classes are offered 100 percent online, with the exception of students enrolled in a capstone course, which requires participation in a business conference and competition. Nursing students with an associate degree or diploma program under their belt can enroll in UHV’s RN to BSN program. The degree is offered completely online and requires students have their RN license prior to beginning classes. San Antonio’s Our Lady of the Lake University is a Catholic school with more than 120 years of experience providing liberal arts education to students. With just over 3,000 students enrolled, OLLU offers over 40 different degree programs either on campus or online. Six online degrees are currently offered, with one program available at the baccalaureate level. Undergraduates at OLLU can earn a Bachelor of Arts in Criminology and Criminal Justice from anywhere they can log on to the internet. An undergraduate minor in criminology and criminal justice is also offered. As attending a private university tends to be more expensive than attending a public school, OLLU helps students find financial aid assistance through scholarships and grants whenever possible. Since 1998, Dallas Baptist University has provided fully online degrees to students, with 75 different programs available to date. At the undergraduate level, DBU gives students 26 potential academic paths to earn their bachelor’s degree online. Students can complete a program 100 percent online in areas such as criminal justice, religious studies, psychology, communication, business and health care management. Online classes at DBU are instructed by the same on-campus faculty, and class sizes are intimate, averaging 11 students per course. Dallas Baptist University also specializes in accelerated online bachelor’s-to-master’s degree programs, giving students the chance to earn two degrees at once. As DBU is a Christian university, the majority of accelerated programs are ministry-based and require completion of either the Bachelor of Arts in Biblical Studies, Bachelor of Applied Science in Christian Ministries or a Bachelor of Arts or Science in Christian Studies. Business students can also earn both their bachelor’s and master’s degrees through the accelerated program, starting with the Bachelor of Business Administration in Management. The University of Texas at Dallas gives graduate students flexible options to earn their degrees. Students can take classes full or part-time and can choose to complete their degree in a self-paced “flex" style or as part of a cohort where students takes classes all together. Regardless of which option a student chooses, they can finish their degree online. UT Dallas has seven online graduate programs and one certificate program through distance learning. Students can choose to study business, criminology, accounting, information technology, management or marketing. How online classes are delivered is left up to the instructor. Classes can include live web conferencing, video streaming, discussion boards and recorded lectures. To help students navigate their digital education, UT Dallas provides online tutorials and resources to keep students on track. Located in the greater Dallas-Fortworth area, Southwestern Adventist University provides online education to students through the school’s distance education department. Southwestern has over 35 years of experience in online undergraduate education, creating alternative ways for students unable to reach campus to earn a degree. The university has nine total programs available, seven bachelor’s degree programs and two associate degrees. Bachelor’s programs can be completed in fields such as religion and theology, business, psychology, history and education. Most options can be completed online, but the Bachelor of Science in Elementary Education program culminates with a 14-week practicum at a regional school district, so online students participating in this program will need to complete this in-person requirement. The coursework students complete through distance education is equal to traditional learning, as classes are taught by the same instructors and demand the same learning outcomes. Angelo State University specializes in online undergraduate degrees in the fields of homeland security, intelligence and border security. Currently, the university offers four online bachelor’s programs available in these sectors. Two of these degrees are Air University-Associate-to-Baccalaureate Cooperative (AU-ABC) programs and require students first earn an Associate of Applied Science degree from the Community College of the Air Force (CCAF). After graduating with an associate degree, students can enroll in one of Angelo State University’s AU-ABC programs to earn either a Bachelor of Border Security or a Bachelor of Intelligence, Security Studies and Analysis degree. Students who do not have an associate degree from the CCAF can still earn an online Bachelor of Security Studies degree, with a concentration in either intelligence, security and analysis or border and homeland security. Online students can access digital resources, such as tutoring and library services, to help reach their academic goals. Southwestern Assemblies of God University has more than 70 online degree programs available at every level of higher education. Half of these programs are available to undergraduate students, including nearly 30 bachelor’s programs. To be considered for an online program, or any admittance to SAGU, applicants must first demonstrate their religious character and prove a positive relationship with Christianity as the school is fervently based in the faith. Specializing in bible and ministry education, SAGU has 16 online programs available in realms such as pastoral leadership, youth ministry, biblical studies and church leadership. The university also offers online degrees in broader areas such as criminal justice, human services, business, history and education. To help students cut the cost of tuition and complete their degree faster, SAGU gives up to 45 credits for previous experiential learning. Students complete a Portfolio for Review course during their first semester to demonstrate their abilities and how their previous work or life experience applies to their major and degree program to receive credit. Tuition for an online undergraduate at SAGU is more than $100 less per credit hour than a traditional degree. At Midwestern State University, students can complete their bachelor’s degree 100 percent online through the school’s distance education department. Online classes are facilitated through D2L, MSU’s selected learning management system. Students can take their orientation online and, once started in their program, can access a host of resources provided to help distance learners stay on track. MSU has four online bachelor’s programs available in health care and technical sciences. Three of these programs are designed to build upon an associate degree and relevant work experience. The RN to BSN program is only for current registered nurses holding an associate degree and can be completed in as little as three semesters. Similarly, the RRT to BSRC degree path is a program for registered respiratory therapists to earn their Bachelor of Science in Respiratory Care. These programs are specific to the careers of nursing and respiratory therapy, and students must have certifications in both to enroll in the degree-completion program. Students with technical training looking for more concentration options can enroll in the Bachelor of Applied Arts and Sciences program. The B.A.A.S. online degree offers majors in criminal justice, liberal arts, adult education, health care administration and human resource development. Students can also choose from 11 master’s degrees and a post-master’s certificate program. The University of Texas at Tyler gives undergraduate students a malleable opportunity to earn their Bachelor of Applied Arts and Sciences degree fully online. The B.A.A.S. is a degree-completion program that incorporates a student’s work and life experience in addition to any prior education to help students finish their degree faster. Students with experiences such as work training, military service, volunteerism or any other method of gaining measurable career skills can begin a prior learning assessment (PLA) to transfer experience to college credit. In addition to the online B.A.A.S. program, UT Tyler offers undergraduate students an online RN to BSN program, though it is strictly for registered nurses to earn their Bachelor of Science in Nursing degree. Students can complete this degree in one year without ever having to travel to campus. UT Tyler is authorized to provided online education in 45 states. Stephen F. Austin State University (SFA), an independent university based in east Texas, provides versatile online degree options for students looking to complete their bachelor’s degree education. Through SFAonline, the school’s web campus, over 20 degrees are available, seven of those being online baccalaureate programs. Through SFA’s Department of Elementary Education, three online Bachelor of Science in Interdisciplinary Studies degrees are provided with teacher certifications in middle school, elementary and special education. While these programs are heavily based online, students may have to attend class on campus, so these programs are recommended for regional students with busy schedules. SFAonline also has two Bachelor of Business Administration degree-completion programs that are fully online, and an RN to BSN program designed for current registered nurses to complete upper-division coursework. To administer web courses, SFAonline utilizes D2L as its platform, creating a virtual classroom for students to interact and finish assignments. At Lubbock Christian University, students can enjoy the attentive nature of intimate class sizes and a school committed to keeping a green campus through clean energy initiatives. For students unable to make it to LCU’s environmentally responsible campus, online education is available at affordable tuition costs. LCU has four graduate programs in hybrid and fully online formats and one undergraduate hybrid program. The Bachelor of Business Administration degree is a mixture of online and face-to-face classes, and several concentrations are available in areas such as economics, marketing, management and finance. Because the cost of college is often an uphill battle, receiving financial aid can make or break a student’s academic dream. At LCU, more than 90 percent of students qualify and receive financial aid. The University of Houston has four bachelor-completion programs and 18 graduate degree programs available online to students. UH’s undergraduate programs are suited for students who have already finished the general education requirements and lower-division courses that a four-year degree requires. After completing the first half of a degree, students can finish the final two years of their psychology, nursing or consumer science bachelor’s degree online at UH. The UH main campus is the largest member of the University of Houston System Online Program, which brings all four campuses’ distance education degrees together in one database. In total, 120 certificate and degree programs are offered among the four University of Houston System schools. Through the Student Pathways program, undergraduates are able to take online credits through another campus, giving students access to more diverse courses. Currently, the program allows a maximum of six credits to be completed away from a student’s home campus. With three Texan campuses and a virtual school, Texas Woman’s University claims the top spot as the largest academic institution for women, enrolling nearly 15,000 students. Through TWU’s e-learning campus, students have 40 degree programs available both 100 percent online and in hybrid structures. For undergraduate students, TWU provides 12 degree-completion programs primarily online. Degree-completion programs only incorporate the final two years of a bachelor degree, which can be either fully or partly online at TWU. Six of these programs are 100 percent online, and students can major in sociology, dental hygiene, general studies, nursing, criminal justice and health studies. The remaining half of the programs require at least one component of on-campus coursework and are offered in subjects such as business, marketing, human resources and accounting. Part of the Texas A&M University system, Tarleton State University has six campuses and seven academic centers, educating more than 13,000 students. Through the school’s global campus, students living across the country can earn a degree online from TSU. Tarleton State has 10 online bachelor’s degree programs, delivering education to students in fields such as information technology, administrative systems, business and criminal justice. Several of the online undergraduate programs are provided as degree-completion tracks. For example, the fully online B.A.S in Veterinary Technology degree requires completion of an associate degree before entry and the B.A.A.S in Business program is tailored for students with any technical or vocational training, for which they can receive 33 college credits. Students with a wealth of work experience can enroll in the B.A.A.S in Manufacturing and Industrial Management and earn up to 84 credits for their experience. For those living outside of Texas, TSU is authorized to provide online education in every state apart from Massachusetts. With 20 years of experience in virtual education, the University of Texas at Arlington provides over 700 online courses, allowing students to earn their degree 100 percent online. Web courses at UTA are delivered through the virtual education platform Blackboard and enable students to experience the same content as on-campus students. As part of the University of Texas System, UTA participates in the school’s Online Consortium, through which students can enroll in number of programs offered to all UT schools. The Finish@UT program is a 100 percent online bachelor’s completion program provided by UTA through the consortium. This program works with students who have previous education, are looking to transfer or have occupational experience to create an online degree path that suits their needs. Courses can be completed in eight- or 15-week sessions, during which students can take a maximum six credits. UTA also offers online bachelor’s degree programs in criminal justice and nursing. At Sam Houston State University, distance education students have many online program options. SHSU Online, the university’s digital campus, provides more than 40 degree programs that students can complete 100 percent online, blended with face-to-face classes or through self-paced online modules. Traditional online courses at SHSU are synchronous and last either seven and a half or 15 weeks. Undergraduates can earn their bachelor’s degree fully online in history, business administration, general studies or criminal justice. The criminal justice faculty at SHSU has been recognized by the Journal of Criminal Justice Education for their research, and the school’s online master’s degree programs take the number one spot in the U.S. News & World Report’s rankings. Undergraduate students can complete four additional programs mostly online. However, some lab and other classwork requires campus attendance. These programs are available in nursing, sociology and psychology. Texas A&M University - Commerce has three divisions for online degree programs based on the amount of distance education that is offered: 100 percent online, fully online, which ranges from 86 to 100 percent, or hybrid, which is 50 to 85 percent online. In the 100 percent division, undergraduate students can complete one of three bachelor’s degree programs without ever traveling to campus. These programs are offered through the College of Education and Human Services and the College of Science and Engineering and bestow graduates with a Bachelor’s of Applied Arts and Sciences degree or Bachelor of General Studies. The online B.A.A.S. and B.G.S. programs are designed for students with occupational experience, awarding college credit for that experience. Classes also operate on seven-week cycles so students can finish their program quickly. Undergraduates can also enroll in fully online or hybrid programs. However, students should keep in mind that attendance on campus may be required depending on the program. There are 10 degree programs within these divisions offered in sectors such as business, computer science and sociology. With more than 100 online degree programs, Texas Tech University gives students living in Texas and beyond the chance to start or finish a degree completely online. Most web courses use Blackboard as the learning management system and follow TTU’s traditional on-campus class schedule. Students have six fully online bachelor degree programs available in general education, human sciences, university studies, applied leadership, early child care and plant and soil sciences. The bachelor of applied arts and science in applied leadership degree requires students to first earn an associate degree before entry to the bachelor program. To compliment an online degree, TTU provides eight undergraduate minors 100 percent online in areas such as agricultural leadership, public health, integrative studies, wind energy and personal finance. Students residing outside of Texas can take advantage of in-state tuition applied to all fully online programs. Undergrads who already have their freshman and sophomore years of college under their belt can enroll in an online bachelor degree from the University of Houston Clear Lake. UHCL has four bachelor of science degree programs that are fully online at the junior and senior level. Through this “completer” program, undergraduates can earn a BS in finance, general business, anthropology or public service leadership. Online students at UHCL have multiple resources available to them at the click of a button, including online tutoring in math and writing, personal counseling and academic advising. Non-Texans are eligible to enroll in UHCL’s online programs with the exception of students living in Pennsylvania, Puerto Rico, Wisconsin and Washington, D.C. as UHCL is not yet authorized to provide online education to residents in these states. 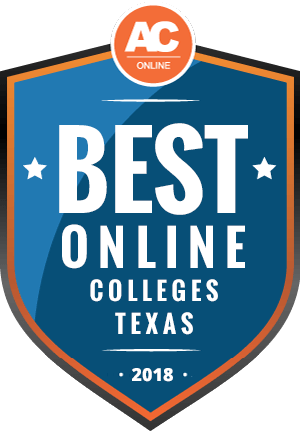 In 2016, UHCL’s online programs won an effective practice award from the Online Learning Consortium. The University of North Texas provides seven online undergraduate and 36 possible graduate programs to students living across the nation. UNT is partnered with the National Council of Reciprocity Agreements to allow virtual education to flow across state borders. Non-residents of Texas however, pay a higher cost for their education at UNT than in-state students and fees vary from program to program. The undergraduate programs at UNT are provided 100 percent online and are designed as completion programs for students with some previous college credits, work or technical training. Students can complete a bachelor of science degree in rehabilitation studies, criminal justice or information science online and complete a concentration or certificate in 12 credit hours. UNT also offers a flexible online bachelor of applied arts and science degrees in leadership development to help students earn the degree that best compliments their future career. Lamar University's division of distance learning brings online education directly to the homes of students unable to take traditional campus classes. Through LU Online students have bachelor and graduate degree programs available as well as single courses. Twelve bachelor degree programs are offered online in majors such as computer science, general studies, engineering, business, communication and sociology. The bachelor of science in industrial engineering and in industrial technology degrees are completion programs for those who either have an associate degree or have completed the first two years of a bachelor program. Similarly, the bachelor of arts and applied science and bachelor of nursing programs are geared towards adults with work experience in the field. Students in LU’s online programs can take classes in accelerated eight-week periods or in a traditional 15-week semester, although not all courses are offered in acceleration. Founded in 1873, Wiley College is a private university with a rich past, being among the oldest historically black colleges located west of the Mississippi River. Wiley enrolls around 1,400 students annually and provides bachelor degree programs online and through a combination of face-to-face and online programs. Wiley’s web-based programs were created for working adults over the age of 25, searching for the opportunity to conveniently start or finish a degree. Students have three online degree tracks to choose from: a bachelor of business administration in organizational management, bachelor of arts in criminal justice, or a bachelor of science in interdisciplinary studies program. The BS in interdisciplinary studies program gives students the chance to study what interests them with nine concentrations available in areas such as communications, diplomacy, environmental studies, justice administration and business technology. Classes are provided at accelerated rates with multiple start dates per year. The University of Houston Downtown has 15 bachelor degree options for students looking to complete their degree online. UHD’s online bachelor programs build upon a student’s previous education and offers upper-division coursework (junior and senior years) all online. Students can finish their degrees in a grab-bag of different subjects including professional writing, international business, criminal justice, supply chain management and interdisciplinary studies. Web courses are delivered through Blackboard, a portal for students and professors to engage in an online classroom. Through Blackboard, students can access class materials and discussions and submit assignments. Before beginning an online program, students first undergo an orientation to college totally online. UHD is permitted to providing online programs to residents in all states except for Massachusetts and the territories of Puerto Rico, Guam and American Samoa. Prairie View A&M University's distance learning department brings education to the student through online courses and degree programs. The university has four master’s degrees available online in counseling, juvenile justice, business administration and educational administration. PVAMU provides its web courses through the D2L class platform and offers resources for using the system online. Courses that are hybrid, both web-based and on campus, also use D2L. To take exams online, some instructors require face-to-face proctoring while others use a digital proctoring service, and inform students prior to beginning class. UT Dallas is a member of the State Authorization Reciprocity Agreements, allowing the school to provide online education to students living beyond Texas. Tuition for online students follows campus guidelines and out-of-state residents must pay a higher rate. The University of Texas Rio Grande Valley (formerly The University of Texas-Pan American) provides several options for distance education through the school’s center for online learning and teaching technology. Students can take single online courses or complete an entire degree, either fully online or through a hybrid format. UTRGV’s web courses are brought to life through Blackboard, the digital portal where online students have full access to the virtual classroom. The university has fully online master’s degrees and partially online bachelor programs, as well as accelerated degrees at both levels. After completing the first two years of a four-year degree, undergraduates can then enroll in one of UTRGV’s online bachelor programs in either criminology and criminal justice, multidisciplinary studies or health services technology. Students who are currently registered nurses can earn their bachelor of science in nursing entirely online. This program is provided in an accelerated seven-week course structure and takes one year to finish. At Texas A&M University Kingsville students can earn a graduate degree in education, business or engineering totally online. Educators in their master’s degree programs can specialize in either adult, bilingual or special education, kinesiology, instructional technology or administration. TAMUK’s master of business administration degree is an online-only program and can be finished in as little as one year. The MBA program allows students to complete complimentary certificates in energy finance and logistics, business analytics or health informatics. In 2012, TAMUK’s M.S. in industrial engineering degree earned the number one spot as the best online graduate engineering program in Texas by the U.S. News & World Report. In all of the available degree programs, students can choose to attend school either full or part-time. Web-based courses use Blackboard, a learning management system, and fall into several categories based on the percentage of online coursework as outlined by TAMUK. Dallas Christian College provides non-traditional education opportunities to students through the university’s FlexCampus. DCC’s FlexCampus allows students to complete a course in six weeks. Students have class scheduled once per week and can choose to participate on campus, online through live conferencing or on demand, in which students watch a recording of the class on their own time. Students can earn their bachelor of science degree through the FlexCampus in practical ministries and bible, business, psychology and interdisciplinary studies. These programs have concentrations available in areas such as bible studies and ministry, business administration and nonprofit management. Completing a bachelor’s program can take two to four years, depending on the student’s previous education, if any. Students can also earn alternative credit for work experience and must demonstrate their abilities by creating a portfolio for review or by examination (such as the CLEP or DANTES tests). A maximum of thirty credit hours can be awarded for experience. Texas Southern University, situated on a 150-acre campus, is one of the biggest historically black universities in the U.S. The 10 colleges within the school system include law, education, business and communications and offer 100 undergrad and grad programs. The university has four fully online degree programs, which are master’s degrees in education, business administration, public administration and administration of justice. Individual classes are also available online that provide a hybrid education, blending on-campus and online learning for a more flexible learning experience. The Robert J. Terry Library offers electronic databases arranged alphabetically or by subject, so even distance education learners can access a wide range of resources through the library. The Office of Information Technology lists a number of resources that can be accessed online, including Blackboard, Grades First and Starrez, which links students to online housing forms and roommate selection. Students can also access the tuition calculator online to accurately estimate the cost of their higher education program. Scholarships are available from the university and outside sources, and further financial aid options and applications can be found online. Texas A&M International University, located in the quickly developing city of Laredo, offers one fully online undergraduate degree, RN to BSN. Eleven master’s degrees and three graduate certificates can also be completed online. Graduate online programs are non-thesis unless otherwise specified. Online classes are available 24/7 for added convenience, and some distance education courses are in video conference or remote classroom format. Many degrees can also be earned on-campus or as a hybrid option, incorporating both online and on-campus courses. Texas A&M International’s degree programs range from fields of study like marketing to music vocal track to communication disorders. The Sue & Radcliffe Killam Library website provides online databases that can be accessed from anywhere. The university ranks as one of the most affordable four-year public universities in the U.S., but students in need of financial aid should visit the Financial Aid office to search through grants, scholarships and loans that might apply to them. In addition to traditional aid, Texas A&M International gives veterans access to services and financial aid options unique to them. Sul Ross State University, spread among its four Texas locations in Alpine, Del Rio, Eagle Pass and Uvalde, boasts small class sizes and only 2,000 students on the main Alpine campus. Its four colleges, College of Professional Studies, College of Agricultural and Natural Resource Management, College of Arts and Sciences and Rio Grande College, offer degrees in fields such as criminal justice, behavioral and social sciences, education and animal sciences. Degrees may be earned online, in-person, via face-to-face interactive TV courses or as a hybrid. The distance education options may vary by location and degree, so interested students should contact an advisor or learn more about the degree options online. The university library provides access to online databases and journal collections for use in any location. Scholarships offered through Sul Ross State vary from aid based on financial need and academics to enrollment in specific programs. Parker University offers many of its courses fully online. Most bachelor’s programs but also some master’s and associate degrees can be completed via distance education. The university is separated into three health-related departments: chiropractic, applied sciences and business of health. The level of on-campus participation varies depending on the program, so students should be sure to check out their desired degree program’s requirements. For example, a Doctor of Chiropractic is a 10-trimester program for which hands-on, in-person experience is a must, whereas a bachelor’s degree in computer information systems is available totally online. The Parker SHARE Bookstore allows students to buy or rent textbooks or buy academic program materials via the website and have them delivered to their door. Some products, however, can be bought only in the physical store. Tuition details are outlined on the website and divided by degree. Financial aid options are offered in the form of grants, scholarships, federal loans, and military and VA benefits. West Texas A&M University’s online programs rank among the best in 2018 in bachelor’s degrees, graduate business, MBA programs, veterans MBA and graduate computer information technology, according to U.S. News & World Report. West Texas A&M provides 58 undergraduate programs, 39 graduate programs and one doctoral program. Students can receive an education on campus, online or as a hybrid, for which some aspects of the classes must be in person, like field experience or a specific face-to-face course. A handful of both undergrad and graduate programs can be completed totally online or as hybrid learning. Three undergrad completion degrees, such as the RN to BSN program, can be finished 100 percent online. The Cornette Library website has a library chat service and an email-a-librarian option for assistance. Through the website, students can browse databases and journals for research purposes. The university admits out-of-state distance education learners who are part of the National Council for State Authorization Reciprocity Agreements or who have an agreement with Texas, which the university can verify. The University of Texas at El Paso offers fully online bachelor’s and master’s degrees, graduate certificate programs and online regulations. The university is part of the the National Council for State Authorization Reciprocity Agreements and can accept out-of-state students whose home state is part of the council. Online degrees are offered in majors such as criminal justice, media advertising and systems engineering. Tuition for an in-state distance learner is $284.21 per semester credit hour. The University of Texas at El Paso was recognized by the U.S. Department of Education for its lowest net tuition of U.S. research universities. The university was also selected in 2016 as a Military Friendly School. In terms of financial aid, military benefits, scholarships, loans and installment plans are all options available to UTEP students. The university has also set up a page dedicated to succeeding online that outlines how to use the Blackboard online classroom and gives advice on what to expect and how to avoid snags in online education. South Texas College boasts one of the lowest tuition rates in the country, providing an education at a value for thousands. Students can choose from 32 online programs that result in associate degrees, bachelor’s degrees or certificates. Students can obtain a bachelor’s degree in computer and information technologies, medical and health services management, technology management or organizational leadership. The Online Student Services department outlines subjects of interest for distance learners, including admissions, financial aid, online advising, student assessment, career opportunities, online tutoring, online textbook purchases and ADA services. Full library services can be accessed online as well. Further student IT support is provided by phone, email, or online chat for password, computer or Blackboard online classroom issues. South Texas College prides itself for its comprehensive Veterans Affairs services, which include health and wellness and educational benefit programs. Students can apply for federal aid and pay via installment plans online. Scholarships are awarded based on merit, need and department and are provided via private or state funds. Criswell College, a Christian college in Dallas, Texas, presents higher education to students interested in shaping their academic and spiritual development. The college provides programs that result in one associate, five bachelor’s and six master’s degrees. Students can obtain a bachelor’s in biblical studies, Christian ministry, psychology or education as well as a degree in philosophy, politics and economics. Up to a quarter of any program may be completed online for added flexibility in learning and scheduling. Two master’s degrees are offered totally online: the Master of Arts in Christian Studies and the Master of Arts in Christian Leadership. Students can complete online classes in half the time as a traditional on-campus course, finishing three credits within eight weeks. Courses are text-based and include writing assignments, exams and research and are enhanced with devotional materials and videos. To determine attendance, distance education students are expected to participate online in a variety of methods, such as a discussion board posting. An extra cost of $150 is applied to each online class. Additionally, the online DTS Book Center helps students with their textbook, reference and supply needs. Texas A&M University-Corpus Christi, the Island University located in the Texas Gulf Coast, stakes claim as the only university in the U.S. on its own island. The school’s five colleges, Business, Education, Liberal Arts, Nursing and Health Sciences, and Science and Engineering, furnish top-ranking degree programs. The university provides its students with a host of bachelor’s, master’s and doctoral degrees and certificates that can be completed online, and it has plans in the works to keep expanding these offerings. Out-of-state distance learners are accepted if they meet certain criteria. The eLine (Electronic Learning in Nursing Education) and eLine-Military are self-paced programs that allow total completion of nursing degrees online. Students can access important information, such as free online classes, research sources, textbooks and digital libraries, online on the Open Educational Resources webpage. The school’s Career & Professional Education resource offers thousands of online non-credit programs from self-guided studies to in-depth career skills training. King's University’s seven fully online degree programs include one associate, four bachelor’s and two master’s degrees, three of which have the option of a Messianic Jewish Studies concentration. The university, ranked in the top 50 bible colleges in 2017, offers its online courses 24/7 so students can log in to class when it’s convenient for them, reaping the benefits of this added level of flexibility. Seven-week sessions are the standard for accelerated online classes; however, some courses are taught in the traditional 15-week increments. It is estimated that the seven-week programs will demand that students spend 12-15 hours on the coursework per week. King’s University even offers an online orientation to help prepare distance learners for what will be required of them. The tuition rate for online learning is the same as that of traditional on-campus classes, but a fee is charged for each online course taken. As if accelerated courses weren’t enough, King’s University also allows transfer students to apply as many as 90 previously earned credit hours to significantly shorten the amount of time to earn their degree. Grace School of Theology, self-described as “A Seminary to the World," prides itself on being an Evangelical Christian higher education institution. Students have the luxury of choosing to earn their degrees 100 percent online or to take classes at one of the various campus locations in Texas. Students may earn a variety of religious-based certificates, bachelor’s degrees, such as Bachelor of Arts in Biblical Studies, or master’s degrees, including the Master of Divinity. One postgraduate Doctor of Ministry is also available. Tuition costs for undergrad and grad programs are $200 per credit hour, and the doctoral program is $400 per credit hour. Non-credit program costs are determined by the overall length of the classes, ranging from one week to 15. The financial aid office can process federal loans, veterans benefits and military tuition assistance and provides the GRACE Tuition Assistance Program. Tuition benefits may also apply to spouses. Career and Ministry Services provides a listing of available jobs that meet the needs of its graduates, but Grace makes no claims or guarantees about the percentage of employed graduates. The University of Texas Health Science Center at San Antonio, with its more than 30 years of EMS education, employs faculty who actively practice in their fields and ultimately provide their students up-to-date health care education. The university offers only two online degrees: the Bachelor of Science and Master of Science in Respiratory Care. The bachelor’s 32 credits can be completed in as little as one year or as many as three years. In-state students would pay $2,615 for both fall and spring semesters if completed in one year. Financial aid options include grants, scholarships, loan programs, fellowships, departmental payouts, and the Hazelwood Act for Texas veterans and their immediate families. Other traditional on-campus degree offerings include a Bachelor of Science in Emergency Health Sciences, Master of Science in Speech Language Pathology, and EMT and paramedic certifications, which require clinicals and other hands-on education opportunities before graduation. The university also boasts of its Physician Assistant graduates’ 100 percent pass rate of the national certification exam on their first try. Texas Tech University Health Sciences Center offers online degrees from two of its colleges, the School of Health Professions and the School of Nursing. The nursing degrees are an accelerated version of a Bachelor of Science in Nursing for RNs or veterans and two master’s programs. The School of Health Professions offers more choices with a Bachelor of Science in Healthcare Management, four master’s degrees and a Doctor of Science, as well as a certificate and post-baccalaureate. Library Resources for Distance Learners provide access to online databases and journals, books and audiovisuals, photocopies, Interlibrary Loan and more. The Technology Support for Distance Learners helps online students troubleshoot issues and provides a how-to guide for navigating common problems. Students can navigate the multiple financial aid options online, including veteran and military assistance and scholarships by degree. Texas A&M University-Central Texas students can choose from six bachelor’s degrees and three master’s degrees, all offered in a 100 percent online format. Bachelor’s degrees in fields like aviation science offer upperclassmen coursework all online, but internships through the university’s partnerships must be completed in person. The university library has eJournals and digital archives that distance learners can tap for their research, and the InterLibrary Loan allows users to request items from different libraries that can’t be accessed at the university. Distance learning fees are $80 per credit hour, and, depending on the internship, the price tag could range from $100 to $3,000 in addition to the regular tuition costs. Students in need of financial aid can look over their multiple financial assistance options, including scholarships with a broad range of criteria. The university also strives to help students prepare for life after college. For example, the Career and Professional Development service is dedicated to helping students land a successful career post-graduation. The University of Texas Medical Branch, located in Galveston, Texas, offers bachelor’s degrees in clinical laboratory sciences and respiratory care; master's degrees in clinical laboratory sciences, occupational therapy, health professions, nutrition and metabolism, and physician assistant studies; and a professional doctorate in physical therapy. Most degree programs through the university, such as physical therapy and rehabilitation science, require students to perform hands-on tasks, so distance learning options are limited. The Clinical Laboratory Sciences department, however, offers a hybrid learning option to qualified students, which allows them to finish most coursework online. The distance learning instruction is provided in the form of streaming videos, PowerPoint lectures, online interactive labs, discussions and online testing, with some on-campus lab sessions required. Tuition plus fees, including a distance-learning fee per credit hour, can make for a pricey education, so students in need of financial aid should be sure to check out the school’s options. Financial aid opportunities range from federal aid to scholarships to work-study programs. Messenger College, a Christian-based higher education institution, believes in creating and empowering spiritual leaders in their Christ-led missions. The college offers two programs, both of which are a hybrid mixture of online and residential courses: counseling, which offers a four-year bachelor’s degree, or Christian ministry, for which students can spend one year earning a certificate, two years for an associate degree or four years for a bachelor’s. Several fees are tacked on to the tuition rate of $325 per credit hour, including an online program fee of $300 per semester. The college encourages students to apply for financial aid through the Federal Pell and SEO grants, subsidized loans, unsubsidized loans or Parent Plus loans. Veterans and their dependents may be eligible for financial assistance through the Veterans Education Act, but should contact their local Veterans Affairs office for more information. Amberton University focuses its education on adult learners and, by doing so, strives to provide a flexible education whether students opt for online or on-campus instruction. The classes are divided into four 10-week sessions per year. Distance learning and classroom instruction are available for six of the university’s seven bachelor’s degrees, including professional development, general business, management, project management, applied studies, and human relations and business. Likewise, 11 of the 15 master’s degrees can be completed in either of these formats. The university utilizes the same part-time and full-time professors for its distance education courses and its on-campus courses. Admission, costs and expectations of students remain the same regardless of whether the classes are taken online or on campus. Amberton provides Distance Learning Tips, such as using time management and communication skills, to help ensure students’ success in their online courses. The On-Line Portal connects online students to discussion forums, research materials, online courses and school email. And, for those who need help paying for school, the university gives tips on applying for federal aid on its financial assistance page. Northwood University-Texas has earned several awards or recognitions for its online courses, ranking as the best online school for a Bachelor in Accounting degree and in the top 20 universities for its online marketing degree program. Through the Adult Degree Programs, online students can earn their Bachelor of Business Administration in a variety of programs, such as accounting, automotive marketing and management, and health care management. The degree can be completed totally online or in a hybrid format of both online and on-campus classes. The Adult Degree Programs are specifically designed to meet the demands of busy adults who need flexible scheduling in education. Most or all of the coursework for a Master in Finance or Organizational Leadership degree can also be completed online. Adult degree students can also take advantage of financial aid options geared specifically toward them. In addition to providing stellar courses, the university’s Career Advancement service helps prepare and connect students and graduates to available internships and jobs in their degree field. Prospective students of online programs in Texas face important choices regarding everything from tuition costs to transfer credits. While asking institutions directly ensures the most accurate information, you can explore our FAQ below for answers to common inquiries. Do online credits cost more or less in Texas? Each school uses its own methodology to determine cost of attendance, which can make it difficult to provide clear answers to questions regarding the cost of online degrees in Texas. The most accurate and useful source of tuition information remains individual research and comparisons of schools you are interested in attending. According to data from the National Center for Education Statistics, the cost of attending a Texas institution, whether public or private, costs less than the national average for residents and nonresidents alike. This applies to online credits as well. As always, when comparing tuition rates, there are no absolutes, and students should be aware that exceptions to these trends can and do occur. Which Texas schools accept the most transfer credits? Most online schools in Texas accept a similar number of transfer credits according to which degree you pursue. Associate programs typically accept dual-credit classes, either from high school or an uncompleted degree. Bachelor programs generally allow students to transfer a maximum of half of all degree credits. Graduate programs vary widely in their transfer credit policies, but generally only allow 1-3 courses to be transferred. One of the most important factors in transferring college credit involves course equivalencies, or which course at one institution fulfills the same requirements as a course at another institution. If you previously completed courses at a school in Texas, you can explore how your credits may transfer through the online Texas Common Course Numbering System. Note that online results may not guarantee transfer eligibility. To get the most accurate information on transfer policies, consult your prospective institution and work with an admissions or academic advisor. This is especially important for nonresident prospective students, whose credit transferability from prior, non-Texas institutions can be difficult to evaluate without assistance. Fully understanding your transfer credit options before you enroll at a school is crucial to saving time, money, and needless frustration. Will any online colleges in Texas accept a GED? According to The College Board, 112 colleges and universities offering distance learning in Texas accept the GED in lieu of a traditional high school diploma. You can explore these schools by replicating the results through your own search with the location tab parameters limited to Texas, majors & learning environment tab restricted to “distance learning” study options, and the academic credit tab set to “accepts GED.” Although some of these schools may only offer certain courses on an online basis, others offer complete degree programs through distance learning, including Alvin Community College (three online degree options), Concordia University Texas (19 online degree options), and Lamar University (31 online degree options). Even if you find your prospective school on the CollegeBoard.org search results, make sure to consult the admissions department to ensure you meet all admissions requirements and complete all necessary prerequisites. How many academic terms per year do online colleges in Texas offer? Unlike the traditional college schedule, which adheres to firm semester or quarter calendars, flexible college start dates allow greater convenience for busy students to begin their degree coursework. This popular distance learning feature is extremely useful for working adults, who may prefer to start classes after a busy period at work, and for parents, who might not want to take part in summer courses. Students should be aware that flexible start dates most commonly apply to graduate and postgraduate degrees, rather than undergraduate programs. As no dedicated database listing applicable schools exists, the best way to locate online colleges in Texas with flexible start dates is to complete research on your own, and investigate the specific options offered by your prospective institution(s). Which online colleges in Texas will accept the FAFSA? Only a handful of colleges and universities in the U.S. don’t accept federal student aid. Thus, a large majority of schools accept federal aid, including those offering online programs. In terms of your FAFSA funding options, the government no longer differentiates between on-campus and distance courses (prior to 2006, a student needed to attend at least half of their classes on campus to qualify for aid). That being said, students interested in online education must make sure to check the accreditation status of their prospective institution(s), as the FAFSA cannot be used for expenses at a non-accredited school. Ensure your prospective school holds accreditation recognized by the U.S. Department of Education or the Council for Higher Education Accreditation. Are there any free online classes I can take from Texas colleges? Earning a college degree requires a significant financial commitment. However, students can enroll in select courses from accredited online universities in Texas at no cost. The most common way is by auditing a course, which means enrolling in a course and completing all required components without receiving a grade or college credit for its completion. In many cases, auditing a course still requires the payment of normal tuition, but costs may be waived for certain individuals, usually college/university employees and senior citizens. Another popular way of taking college classes for free involves utilizing massive online open course (MOOC) websites such as edX. These innovative sites allow individuals to choose from hundreds of self-paced, college-level courses either at no cost or an extremely low cost. Online schools in Texas currently contributing to edX include several colleges in The University of Texas system. Similar to auditing courses, MOOC websites typically do not result in transferrable or degree-granting college credit, but instead promote educational accessibility, and lifelong learning. How can I find the online program options at Texas colleges? Unfortunately, no statewide database listing online programs in Texas exists. In most cases finding online program options suited to one’s goals and financial needs remain the responsibility of the individual. This may require utilizing basic search engines such as Google or Bing, or exploring third party site lists and rankings like ours here at Affordable Colleges Online. Utilizing college specific search websites such as The College Board can also prove helpful. Using this resource, limit initial search results to Texas colleges in the location tab, “distance learning” in the learning environment tab, and then further narrow options according to your intended major or field of study. While schools listed in your search results may not necessarily offer the online program you want, this tool will hopefully make it easier to find a school that does. For students with financial need preparing to pursue their first four-year degree federal Pell Grants, offered through the FAFSA, remain one of the best aid sources. Students ineligible for FAFSA aid, however, can still utilize scholarship opportunities. Explore a few Texas college scholarships in the list below. BAFTX offers scholarships for both undergraduate and graduate students studying math, science, engineering, business, or technology. Eligible applicants include residents of the UK or Texas coming from low-income families, enrolling full time, and maintaining a minimum 3.25 GPA. Applications require an essay, photograph of applicant, FAFSA results, and a letter of recommendation. Each year Champion Energy recognizes three qualified high school seniors for their community service achievements. Applicants must be residents of Texas, Pennsylvania, Illinois, or New Jersey, possess a minimum high school GPA of 3.0, and plan to attend an accredited two-year or four-year college. Applications require submission of an essay. Funded by the Community Foundation of West Texas, this annual scholarship offers financial aid to residents of Texas graduating high school with a minimum 3.0 GPA and planning to pursue a college degree. Applicants must show demonstrated service to their community and high school. Offering financial assistance to aspiring college students in underserved communities the Ford Driving Dreams Scholarship program accepts applicants from North Texas, Houston, and San Antonio. High school seniors must hold a minimum 3.0 GPA, meet SAT/ACT score requirements, submit an essay, and a letter of recommendation. Applicants must be permanent residents of South Texas or West Texas, and currently pursuing an undergraduate or graduate degree at an accredited institution. Students must have completed 12 or more undergraduate credits before applying, be enrolled full time, and maintain a minimum 2.7 GPA. Applications require submission of FAFSA results and transcripts.